The annual travel rush during the Spring Festival holiday season started last Sunday, when 150,000 passengers flocked to the Beijing West Railway Station to embark on their homeward journeys. This year's Spring Festival falls on Feb. 8. 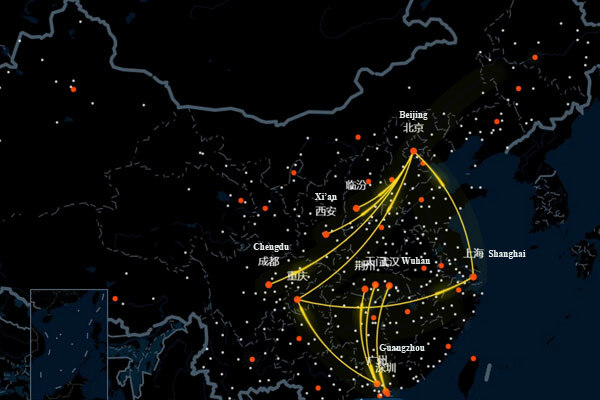 The big data map of migration published by Baidu shows the busiest routs on the first day of the Spring Festival travel rush. The first day of festive travel saw 7 million visits across the country, which increased roughly 1 million when compared to last year's number. According to the data collected from QQ browser and the ticket service center of the China Railway Corporation, the pinnacle of travel rush ahead of the festival will come on Feb. 5 of this year. The busiest routes have been highlighted as Beijing to Harbin, Beijing to Xi'an, Beijing to Wuhan, Beijing to Zhengzhou, Guangzhou to Wuhan, Guangzhou to Chongqing, Guangzhou to Zhengzhou, Guangzhou to Changsha, Shenzhen to Zhengzhou and Shanghai to Xi'an. The top five busiest departure cities are Guangzhou, Shenzhen, Beijing, Shanghai and Hangzhou. Meanwhile, the busiest arrival cities are Wuchang, Chongqing, Chengdu, Wuhan and Zhengzhou. The deadline for purchasing tickets online has extended from 2 hours to half an hour ahead of train departures. Passengers intending to purchase several tickets online are advised to ask for more people to book them, as successful transactions are usually restricted to those demanding only one or two tickets. Big data on travel patterns shows that while many people are leaving metropolises for family reunions during the Spring Festival travel rush this year, some will be traveling in the reverse direction for the same reason.